Narayan (pronounced na ra' yan) Donaldson is a recent graduate of Urban Planning at the University of Waterloo with an interest in transportation infrastructure. I am planning to start reviewing bicycle routes, which got me thinking – what makes a good bicycle route? So after a bit of brainstorming, I came up with a series of categories that could be applied to any bicycle route to come up with an overall rating. I calibrated the weightings on some routes I know such that the overall score generated is consistent with the overall score I would have given it. When I moved to Waterloo, I was initially impressed by the winter path maintenance – the fact that there was any at all. In the part of Toronto I lived in, the city made no effort to keep any paths clear. 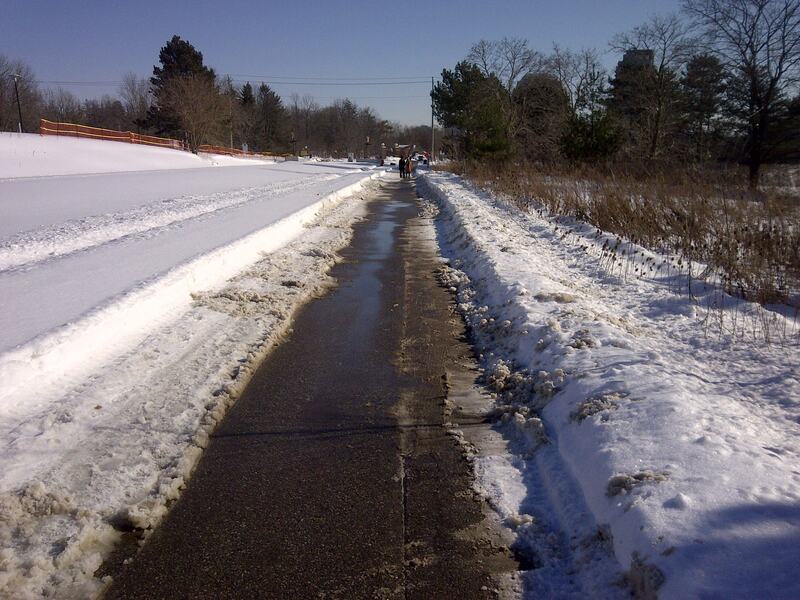 But this year, snow clearance of the Laurel Trail has been so poor that the path is basically unusable. During my commute last Tuesday, the state of the path was so poor that I was really pushing my limits in terms of bike control and physical exertion. On top of that, the ride was so bumpy that my bike’s chain jammed three times within the 300 metres I travelled along the trail. The fact that the worst part of my commute is along a bicycle path says something about the state of the cycling network in winter. When the only way to travel by bicycle is to share space with fast-moving cars, few people will travel by bicycle. It doesn’t matter if it’s twenty degrees below freezing or twenty degrees above. So I decided to take things into my own hands, and shovel the path myself from Seagram to University. At the last Public Information Centre for the Uptown Streetscape Improvement Project along King Street, City staff received comments on their proposed design, including that the bicycle lanes were too narrow and unsafe-looking. Drop in any time 5:00 p.m. – 8:00 p.m.